Under the new contract, starting January 1, 2014, the District will provide up to $600.00 per period for reimbursement of employee-incurred health benefit costs to all part-time employees who are employed in the District at 40% or more of a full-time load (6/15 FLC) and complete a 40% load. The reimbursement will be paid for the periods January through June and July through December. The ACA mandates health care coverage. Adjuncts that do not have health insurance will have to purchase health insurance through the District at 100 percent of the cost (less the reimbursement under the contract), or on the health insurance exchanges through CoveredCA, the California health care marketplace. The District reimbursement applies to any health care plan you purchase. With the ACA, all of us have access to the new insurance marketplace. So, two of our adjunct professors, Lin Bowie, CSM EC Representative and Biology Professor, and Caroline Bowie Stockhus, CSM English Professor, decided to explore their options. Lin and Caroline happen to be related. Caroline represents a younger-aged adjunct, and Lin represents the somewhat older generation. We used the same income, the same zip code, and just varied the age and medical needs slightly. A summary of premium costs and copays/coinsurance is shown in the two tables. 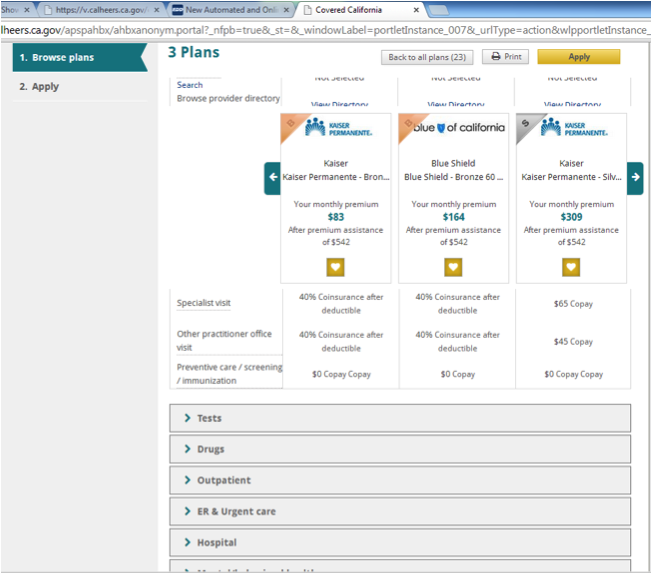 If you want to explore CoveredCA, see the instructions and some example screen shots on our web site. Lin used to purchase health insurance on the private market some years ago, but now gets her coverage through the District. Lin went to the District because, overall, it was cheaper than the private market for her current age and health needs. Lin teaches enough units to qualify for the $600.00 reimbursement per semester under the AFT contract. Lin used her income from the District, so she could be an example of a typical older adjunct professor. She keyed in her household information to see what her choices might be.1 Lin is in a single-person household, with her children grown and on their own. Lin also teaches the summer semester, which raises her overall gross adjusted income for the year. Here is a brief comparison of what Lin found when she took only her gross income that she earns at the District (her salary and unemployment compensation). To make things equivalent, both Lin and Caroline used the same criteria, and compared a Bronze Kaiser, Bronze PPO, and a Silver Kaiser Plan. Lin and Caroline accessed the CoveredCA web site at www.coveredca.com. 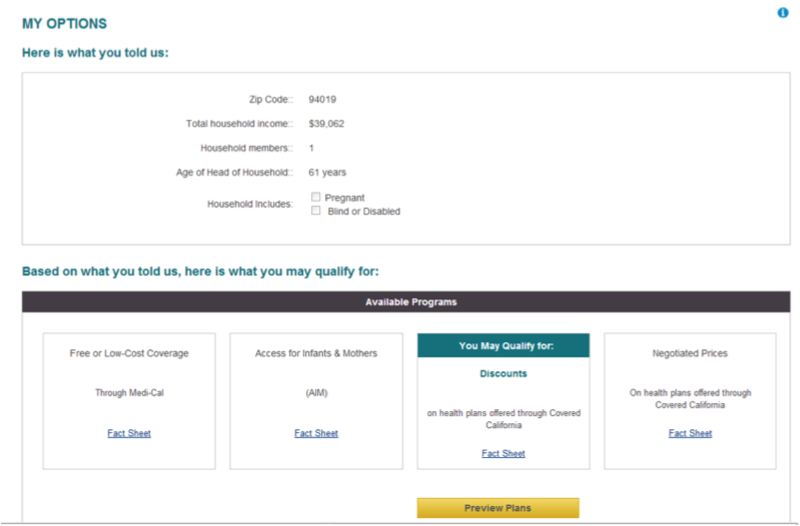 When you access the site the screen gives you an option to compare plans directly, but for the purpose of this article we used the “Start Here” feature. 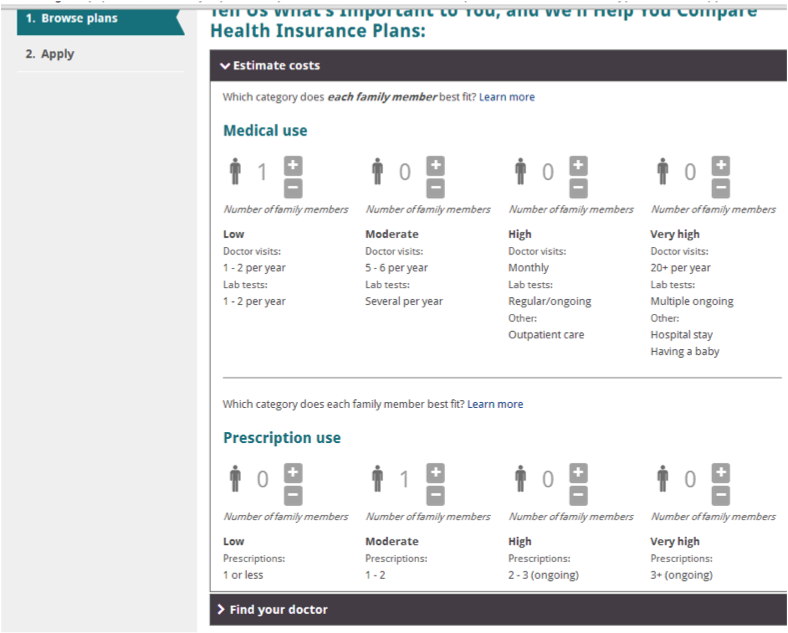 The next screen leads you through a series of search parameters to help you compare costs and plans. 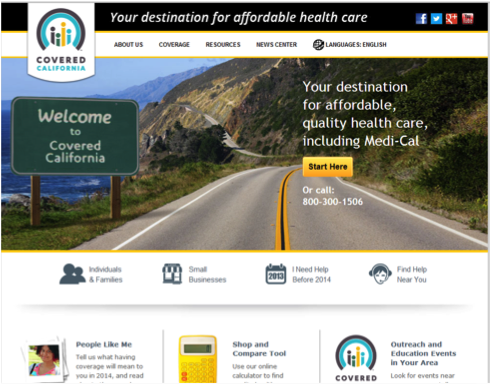 Note: There are more items listed on the coveredca.com web site than are shown here. This is an overview of how the coverage items work for comparison. 1 In the interest of full disclosure, Lin is above the cut-off for program eligibility for premium assistance, because of additional income from other sources prior to becoming a teacher. She is staying with the District plan for now, even though it costs more per month, because the coverage is a little better. Caroline is currently purchasing health insurance on the private market. She can get this at lower cost because of her age and needs, compared to the District Plan. However, if Caroline needed to purchase a platinum or gold plan, she would not save much money and would probably stay with her private plan.